EDINBURGH was bracing itself for a French invasion beginning to day as thousands of rugby fans head to the capital for tomorrow’s crunch Six Nations clash against Scotland at Murrayfield. 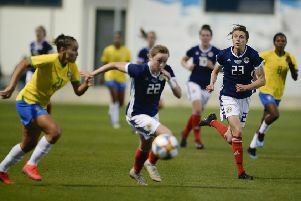 The sell-out game – the 92nd meeting between the two teams – is one of the highlights of the sporting calendar given the strong links between the Auld Alliance. Officials at Edinburgh Airport said it is “expecting numbers well into the thousands” over the weekend with the fixture expected to generate millions as fans of both shades of blue descend on bars and cafés around the city. But the biennial French invasion is not just a boon for the economy – it is an exciting time for the city’s 2,000-strong French community. Edinburgh’s French connection goes back centuries to when Mary Queen of Scots, brought an entourage to the city and established Little France. The city is now home to dozens of French-owned restaurants and cafés. Vincent Fontaine, manager of Café de la Poste, arrived recently in Newington to “start a business and learn English”. Antoine Raymond, manager at Café Tartine in Leith, said: “Historically, perhaps because it was such an important port, there’s always been a real connection between Edinburgh and France. Lucy Chevalier, covering manager at Cote Brasserie, thinks visiting French supporters are more likely to go to the pub than French restaurants. She said: “I’m excited to see the influx and how many French people come through, but we don’t have many bookings from French people really. The French government has taken steps to reinvigorate relations by opening up a new cultural and diplomatic base on the Royal Mile. The first French consulate was opened in Edinburgh 200 years ago.